The first recorded reference to a game in which a ball is thrown at pins dates from 300 A.D. The reference comes from Germany where the game was part of a religious ceremony practiced by monks. During the ceremony, the pins signified the bowler's sins, which were to be struck down with a ball. Once discovered, bowling spread in various forms throughout Europe. In 1366, King Edward III of England is said to have outlawed any form of bowling (apparently it was distracting his troops). In the early 1800s, the modern game of bowling with nine pins first appeared in the United States. There was not any standardization of the game and regional rules and specifications prevailed until 1895. At that time, restaurateur Joe Thum assembled representatives of various bowling clubs in New York City and created the American Bowling Congress (ABC). The pins used in this early competition and for another half century were made from a single block of hard rock maple. These solid pins were durable enough and were simple to manufacture. The only significant drawback was that, with the varying density of wood, the weight of an individual pin was difficult to standardize. Then in 1946, American Machine and Foundry purchased the patent for an automatic pin setter and began producing a machine that would both popularize the game and change the way bowling pins were made. The new machine was not an immediate success. Bowling alleys had plenty of pin boys to reset the lanes, and the original machinery was relatively undeveloped. However, patrons enjoyed the speed of the new pin setters, and the machines could work long hours without rest. As the automatic pin setters became more widespread, a new problem arose. The pin setters were much harder on the pins than human hands had been, so the pins began splintering and cracking much more rapidly. In turn, the splinters from the pins were fouling the machinery of the pin setters. In 1954, Vulcan Manufacturing produced the first pin to address the problem, the Vulcanate. Vulcan sawed a standard solid pin in half before its final shaping and glued a flat piece of maple between the halves. With this design, Vulcan could drill wood out of the center piece as needed to reduce the pin's final weight. The design also presented more edge grain to the outside of the pin, making the pins more resistant than the solid wood ones. That same year Henry Moore introduced a plastic-coated pin. As with the pin setter, the new coating was not immediately embraced by the bowling industry. The liquid plastic used in Moore's pin added significant weight and chipped easily. However, the concept behind the pin design was sound and soon manufacturers began searching for a lightweight and durable coating. Even the lightest of coatings added weight to the pins, which decreased scoring, so manufacturers moved away from solid maple and began to follow Vulcan's example of gluing smaller pieces together into the shape of a pin. By 1961, the solid pin had disappeared altogether. As mandated by the American Bowling Congress and the Women's International Bowling Congress (ABC/WIBC), all bowling pins are made "of new (unused), sound, hard maple." Other materials may be used if they are given ABC/WIBC approval. The maple used is harvested above the 45th parallel, which runs through the northernmost states of the United States, above the areas where high mineral concentrations lessen the wood's density. Other core materials have been tried. In the late 1960s, manufacturers attempted to further the lamination concept by using particle lumber. Particle lumber is made by shredding wood, mixing it into a bonding agent, and pressing it into shape. The problem was that a dense mixture made the pins durable but low scoring, while light pins had the opposite problem. A polypropylene-fiberglass foam core known as a dykehouse core was also attempted. The foam was molded in two pieces, top and bottom, and the halves were fitted over a wooden dowel. Durability tests were impressive, but the project never developed into production. When pins were made of solid blocks of maple, they were simply coated with a layer of white lacquer and finished with a layer of clear lacquer. The advent of the automatic pin setter spurred a need for more durable coatings, and the first successful one was ethylcellulose. Ethylcellulose coating was a seven-layer process. Pins were first dipped into a coat designed to seal the pores of the wood and then into one designed to provide better adhesion for the following layers. Then five layers of ethycellulose were applied. After the first layer, a nylon mesh sock was stretched over the pin where it acted like iron reinforcing bars in concrete or like straw in adobe brick, providing a structure for the ensuing layers. The two coatings in use today are nylon and DuPont's Surlyn. Nylon has the advantage of being more forgiving in the molding process and having a lower cost than Surlyn. But cores must be dipped in latex to prevent the nylon from cracking, and nylon does not provide the same rigidity as Surlyn. 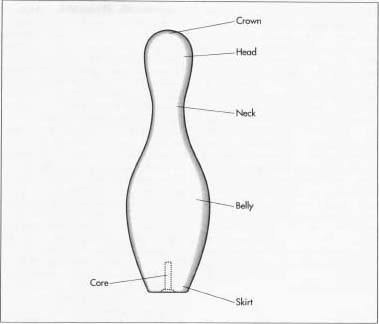 The three considerations in designing a bowling pin are durability, scoring, and sound. The durability of pins has been vastly improved with the use of multi-piece cores and more resilient coatings. Multipiece cores are stronger and more durable than durable single blocks because of the way in which wood grows. A tree grows larger in layers or rings, each ring following the contours of the one under it. If the previous ring had a kink or curve in a certain spot, the next ring will also have that kink or curve, as will all the following rings. When you use a single block of wood, all of the layers in that wood will flex and eventually break in the same spot because they are all shaped the same, but if you take several small pieces and glue them into a block, each piece has its natural bends and weak spots in a different place, so each reinforces the other. An additional benefit of this method for bowling pins stems from the way in which the rings hold to one another. When a tree is in its natural state, its cross section is a series of concentric rings. Once milled into lumber, the cross section only contains portions of the rings, so it more closely approximates stacked sheets of cardboard. If you were to push against the side of a stack of cardboard, each sheet would be fairly rigid but each would slide out of the stack fairly easily, and you could lift off the top sheets with no trouble at all. If you were to press on the top of the stack, you could not easily split it in half but it would compress with little effort. This is exactly the situation with bowling pins. The old solid pins would dent on the face of their grain layers, and the large, flat layers would peel and split at the edge. Gluing together several pieces of wood gives the compression resistant advantage of presenting all edge grain to the outside of the pin, but because no one layer runs all the way through the pin, they are less prone to splitting. A bowling pin is a complex assembly of several maple wood pieces; each made of still smaller pieces. Each sub-assembly is glued and clamped into a pressurized mold to build it into the next larger piece. sound. The distinctive sound of pins crashing is part of the aura of the game, and that sound comes from wood. Presently, no other material has been able to match it. A bowling pin is a complex assembly of several maple wood pieces; each made of still smaller pieces. Each sub-assembly is glued and clamped into a pressurized mold to build it into the next larger piece. Lumber is dried in large kilns for 8-10 days before being shipped to the plant. When it reaches the plant, entire planks are cut at once into strips and then into blocks of specific size by multi-bladed automatic saws. 1 The core of a pin begins with the post. The post is made up of three sections of maple, each 2.8125 in (7.14 cm) wide by 0.875 in (2.22 cm) thick by 15.5 in (39.3 cm) tall to form a slightly rectangular 15.5 in (39.3 cm) tall block. At the same time, eight strips of 16 in (41 cm) long 0.875 in. (2.22 cm) by 1.25 in (3.17 cm) thick maple are glued to form a 7 in (18 cm) wide by 16 in (41 cm) long board called the panel. The panel is run through an electric planer to make its top and bottom surfaces flat and even, and then it is cut with a table saw lengthwise and in half into two 3 in (8 cm) wide pieces and two 4 in (10.2 cm) wide pieces called cheeks. The cheeks will be glued to the post to form the large bottom end of the pin known as the belly. 2 First, the 3 in (8 cm) cheeks are glued 1 in (2.54 cm) from the bottom on the longer side of the post and the assembly is clamped into a jig to ensure alignment of all the pieces. 3 Once this assembly has dried, it is run through the planer to make its edges flush and to make the post a perfect 2.625 in (6.67 cm) square. Then the piece is run through a machine that weighs it, calculates its density, and determines the amount of wood that needs to be removed to bring the final pin within specifications. 4 The machine drills into the post to adjust its weight then repeats the process until the pin falls within a 4 oz (113.4 g) weight range. The 4 in (10.2 cm) cheeks are glued over the holes, overlapping the sides of the 3 in (8 cm) cheeks and the new assembly is again clamped into a jig to properly align all the pieces. At this step, the core is called the billet and has the basic shape of a bowling pin except that it is square. A hole is drilled into the center of the bottom of the billet to be used later to center the pin during the coating process. 5 The billet is then placed on a lathe and a single blade matching the profile of an entire pin cuts it into its final shape. 6 The primary method used today for coating bowling pins is injection molding. The process involves placing an object into a two-piece metal mold, with each piece carrying an impression of half the object to be molded. In the case of bowling pins, the halves are identical. If nylon is used as the coating, the pins are first dipped in latex to prevent the nylon from cracking. 7 The turned core is placed in the bottom half of the mold. A retractable pin slides into the center hole that was drilled into the bottom of the billet. This pin and several raised pieces in the mold called hold downs will hold the core in the center of the mold while the coating is applied. The mold is then closed and clamped shut. 8 The coating is injected under high pressure through numerous small openings called gates. This high pressure not only ensures an even coating but it evenly compresses the wood, effectively making it denser and more resistant to denting. 9 Once the predetermined amount of coating has been injected, water is run through tubes in the mold to cool it. The cooled, coated pin is removed from the mold and a worker trims the stalks of coating left by the gates. 10 The surface is then sanded to remove any remaining excess left by the gates and to smooth the slight impressions made by the hold-downs. The pin maker's emblem, the ABC/WIBC approval stamp, and any decorative markings are silk-screened onto the surface. 11 Then, a final protective gloss coat is sprayed onto the pin. The bottom of the pin is trimmed flat and a hard plastic ring is glued into a notch at the bottom of the pin called the skirt. The ring will both protect the skirt and will provide the 5/32 in (0.4 cm) radius the ABC/WIBC requires along the outside edge of the pin's base. Much of the wood used in the manufacture of bowling pins is itself a byproduct. The flooring industry mills thousands of board feet of maple every year. Because consumers prefer light-colored wood, the darker parts of the lumber are trimmed. Since a bowling pin is coated, color does not matter. Mills have begun to trim these pieces to the size used in pins, so what had been scrap is now a useful product. The ABC/WIBC sets strict standards for pin height, weight, moisture content, coating thickness, center of gravity, and myriad other details. Each new pin design must meet these standards and must pass specific durability field tests. The manufacturer inspects each block of wood before it enters the assembly process. Pieces with knots, cracks, mineral deposits, or irregular grain are rejected. Once in use, a pin will last six months or so before it needs to be patched or recoated. Afterwards, it will last another six months before breaking. Most breaks happen in the thin area just below the top called the neck, where the whipping action of being knocked over flexes the wood by as much as 0.25 in (0.63 cm). Maple has been the core material of choice for bowling pins for well over 200 years. Despite experiments with such diverse materials aluminum, plastic, and magnesium, nothing has been found to provide the durability, sound, and scoring range of maple. Borden, Fred and Ackerman, John. Bowling. Madison, WI: Brown & Benchmark, 1997. Stallings, Howard. The Big Book of Bowling. Salt Lake City: Gibbs Smith, 1995. Steele, H. Thomas. Bowl-O-Rama: the visual arts of bowling. New York: Abbeville Press, 1986. Williams, Donald. The Bowling Trivia Book. Novi, MI: Williams Bowling Group, 1995.
International Bowling Museum and Hall of Fame. http://www.bowlingmuseum.coml .